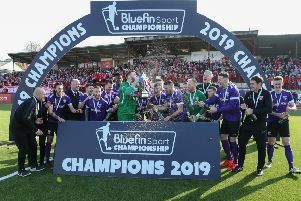 Larne’s Scott Irvine believes a lack of consistency cost the Invermen a chance at promotion, as they came tantalisingly close to achieving a play-off place on Saturday. In the end, Larne finished level on points with Institute and missed out on the promotion opportunity by a single goal. It was a remarkable chain of events on Saturday as David McAlinden’s men won 6-1 against already relegated Lisburn Distillery. That was coupled with Institute’s 1-0 defeat Ballyclare Comrades, when a seven-goal swing was required. However, Irvine feels he and his team-mates had enough opportunities to wrap up the play-off place during the season. “We had runs of eight or nine games unbeaten then we lost two or three in a row and that happened to us a few times,” he said. “In this league you can’t do that, because all the teams beat each other. You can’t be that inconsistent and that’s what has cost us. “It was almost over for us going into the Distillery game, but the boys kept going. Another remarkable fact about Saturday was Larne didn’t break the deadlock until the 65th minute. After that the floodgates opened however, as Guillaume Keke (2), Sammy McIlveen, John Donnelly and Darren Stuart gave them a 5-0 lead. One more goal would have been enough, but Darius Roohi broke the home side’s hearts with a breakaway goal. Donnelly bagged his second to make it 6-1 in stoppage time but Larne ran out of time as Institute booked their double date with Ballinamallard. “It took us 60 minutes to get going,” Irvine said of Saturday’s game.